A new CBC livestreaming documentary series tells the stories of unconventional crimes that often don't make front page news, but nonetheless carry serious consequences for vulnerable family businesses trying to stay afloat. As fisherman George Dowdle was leaving to take his wife Marlene to the cancer treatment centre, he waved to the thief who would later steal oysters from his 60-acre farm in New London, P.E.I. Dowdle and his wife have been in the oyster-cultivating business for the last 32 years. It wasn't the first time he had been the victim of theft — in fact, he said it's quite common. "Over the past 10 years, two, three times a year this happens," he told The Current's Anna Maria Tremonti. "I've probably lost over $100,000 just in stolen oysters, stolen equipment." Dowdle's story is one of many in the live streaming CBC documentary series Farm Crime, featuring stories of larceny that take place on pastures and farms across Canada. Each episode examines an unconventional crime — the sort that often doesn't make front page news, but nonetheless carries serious consequences for the people affected. The most recent theft on Dowdle's farm occurred in 2016, only five days after Marlene was diagnosed with terminal brain cancer. She was given one week to live. "Everybody knew that my wife was sick, like I mean oyster communities … everybody knows everybody, either by name or by reputation," Dowdle said. The thief, a wild fisher in the industry who was known to Dowdle, took advantage of his vulnerability and later admitted he knew she was sick. "We're not a big operation. We're basically a family thing and you know it's basically hand-to-mouth. So them stealing keeps the profit down," Dowdle said. 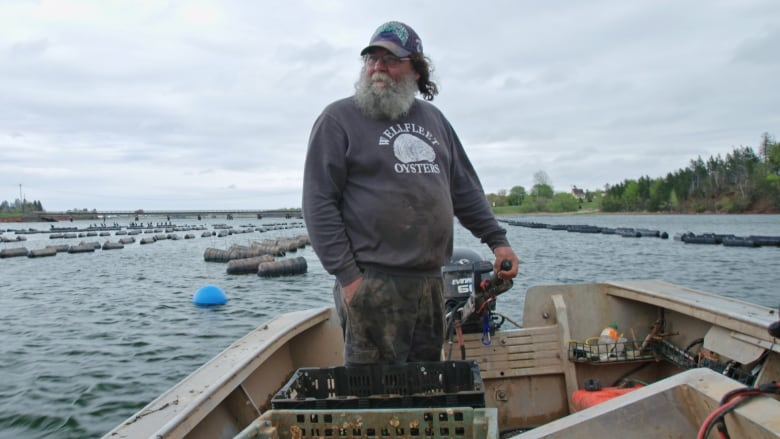 He's been running the oyster farm with his children now after his wife passed away in April 2017. Dowdle's case in 2016 became the first time in Canadian history that an oyster thief was caught, prosecuted and convicted. The judge fined the wild fisher $5,000. "It was precedent-setting case," he told Tremonti, largely because a witness was able to take pictures of the oyster heist in progress for evidence. Dowdle is happy a conviction was made, but considers the fine to be light. He would have preferred to see the thief's wild fishing license suspended for a year. In the end, Dowdle received only 30 per cent restitution. The stolen oysters were confiscated by Fisheries and Oceans Canada and later sold in an auction by the Crown. To Dowdle, the greatest loss from the incident was being forced to spend time in court rather than by his ailing wife's side. "For seven months I was at the hospital with my wife. I never left her side and, you know, to take time out to go to court because this individual pleaded not guilty even though he was caught solidly, those moments I never get back. They are lost for good." Produced by The Current's Samira Mohyeddin.